"The Amazon rainforest plays an important role in the southern hemisphere by transpiring moisture that is transported by clouds to many places that need precipitation," said Jose D. Fuentes, professor of meteorology, Penn State. "However, there's a big gap in our knowledge of the underlying processes that influence the formation of clouds." The team conducted its study in the Brazilian Amazon rainforest because it has a "clean" environment that is relatively free of ozone and pollutants. "In the clean tropical Amazon there is typically much less ozone near the Earth's surface compared to more industrialized areas," said Tobias Gerken, postdoctoral scholar in meteorology, Penn State. "This is because ozone is formed from the reactions of pollutants, nitrous oxides, sunlight and oxygen." The team monitored levels of various trace gases, such as ozone, and meteorological variables, such as precipitation and wind speed, under the canopy of the rainforest. They found that deep, convective storms transported ozone-rich air parcels from the Earth's atmosphere to the surface, rapidly increasing surface ozone levels from 5 parts per billion by volume (ppbv) to nearly 40 ppbv. "Deep, convective storms have two channels, one with upward moving air and another with downward moving air," said Fuentes. "Downdrafts bring ozone molecules down from the upper troposphere (the lower layer of Earth's atmosphere) to the surface where they can mix and react with other chemicals." This increase of ozone at the Earth's surface can influence several atmospheric chemical processes, some of which may affect cloud formation via the reaction of plant emitted hydrocarbons. These reactions result in the formation of aerosols. Clouds form when water vapor rises into the atmosphere, cools, and condenses onto aerosol particles that act as cloud condensation nuclei or "cloud seeds." When enough water vapor condenses on these nuclei, a visible cloud forms. In the rainforest, the team found that this process can be initiated and accelerated when ozone interacts with hydrocarbons, which are molecules made of hydrogen and carbon that are naturally produced and emitted by vegetation. The hydrocarbons react with ozone—then, through a chain of chemical reactions, the hydrocarbons transform into other molecules, which condense and can eventually result in the formation of cloud condensation nuclei. In addition, when ozone oxidizes hydrocarbons, it results in the formation of a second kind of molecule that oxidizes and breaks down hydrocarbons—hydroxyl radicals, which are molecules made of one hydrogen and one oxygen molecule. Hydroxyl radicals are commonly considered the cleaning agent, or detergent, of the lower atmosphere because they initiate the breakdown of many pollutants as well as hydrocarbons. When ozone rose from 5 ppbv to 30 ppbv, this could nearly double the production rate of hydroxyl radicals, the group found. These changes in atmospheric chemistry resulted in a much quicker breakdown rate and shorter lifespan for hydrocarbons, the team found. 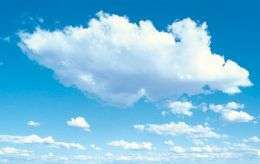 For example, a group of hydrocarbons known as monoterpenes, which normally live for up to 90 hours when ozone is at 10 ppbv, only lived 20 hours when ozone increased to 40 ppbv. The team also found that ozone levels in the rainforest remained elevated for more than two hours after storms, which highlights the importance of the ozone increases. Storms occurring during both night and day increase the oxidation and breakdown of hydrocarbons in the lower atmosphere for an extended amount of time. This study also investigated the variety and amount of hydrocarbon gases being produced naturally in the Amazon rainforest. The team found the presence of more than 25 different types of hydrocarbons, all of which could play a role in cloud formation. "The more we know about the rainforest's atmospheric chemistry and how that can influence cloud formation, the more we'll understand the Amazon's role in global weather patterns—and how changes in the rainforest could affect those patterns," said Fuentes. The team published its findings in the current issue of Atmospheric Environment.